Improve soil with compost and earthworms. Blog / General Gardening / Soils & Fertilizers / Making Great Soil: Compost, Worms and More! Making Great Soil: Compost, Worms and More! Fortunately, one way to find out how your soil is doing is to do a soil test. Most gardeners think they need to add fertilizers to their soil to feed their plants. Experienced gardeners know that a soil test will help them pinpoint which specific nutrients—if any—their plants need, and in what proportions. The North Carolina Department of Agriculture & Consumer Services provides free soil test boxes, instructions, and soil analyses for North Carolinians between April and November. There is a $4 charge per sample for those received December through March. Pick up boxes and instructions at the Buncombe County Extension office and then ship your samples to the lab in Raleigh. But soil tests only give you information about the mineral elements essential for plant growth. Mineral elements are a small part of what soil scientists, biologists, and plant specialists call the “Soil Food Web.” This web is an intricate interrelationship of earthworms, insects, arthropods, and microorganisms, such as beneficial nematodes, protozoa, fungi, and bacteria. Their job in the soil is to make mineral nutrients available to the plants, preserve soil moisture, improve soil texture by opening spaces for air, and continually replenish the soil through the decomposition and recycling of organic materials. The $64,000 question? How do we increase the organic content of our soils? One of the most common answers is through composting. Composting involves recycling of organic materials— grass clippings, leaves, small twigs, weeds, garden refuse, and vegetative food scraps—from your yard, garden, and kitchen. In addition to creating a separate compost pile with such materials, you can use an in-place composting technique called “chop and drop.” Simply cut weeds, leaves, vegetable scraps from the kitchen, and so forth into small pieces. You can do this by running your lawn mower over them or chopping up things with a knife or shears as you gather them. Pull back the mulch in your planting bed, put down the chopped up stuff—cover with a sheet or two of newspaper if you want to help conceal the contents—water, and then put the mulch back over the drop spot. It’s possible to do double duty to improve your soil: recycle organic matter and become a worm whisperer! Two types of worms help improve our garden soil: Nightcrawlers (Lumbricus terrestris), which dig deep vertical channels, aerating the soil and allowing for water penetration, and red wigglers (Eisenia foetida), which dig more horizontally, speeding the decomposition of the organic matter they eat. 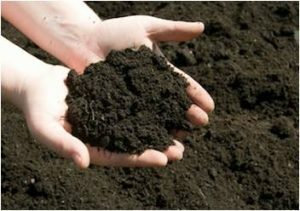 Both pass worm castings that are rich in nutrients for the plants and for the tiny microbes working within the soil. You can purchase red wigglers if you want to set up a worm-composting bin (also known as vermiculture). A comprehensive book on the subject is Keith Reid’s Improving Your Soil, 2014 Firefly Books. For fun, read Amy Stewart’s “funny and profound” The Earth Moved: On the Remarkable Achievements of Earth Worms, 2004, Algonquin Books. Article written by Mary Hugenschmidt, Extension Master Gardener Volunteer.